The moon symbolism is an important planet in astrology. It moves into a new sign every couple of days, and this could be why it has more control over the daily aspects of life. If you are feeling stressed out one day, then the Moon can help you to restore your emotional balance. Also, it is important to keep harmony between the Sun and Moon. While the Sun drives your actions and general identity, the Moon guides your emotions. If these two are not in balance then you will not be very happy. Let us see how the Moon influences our feelings and emotions in the 12 houses. When the Moon is in the first house, your friends and family might notice that you are acting a little over-emotional. You will want to be happy, but you are likely to have many mood swings that will try to prevent this. Fight through it in order to stay happy. The way that you spend money will be affected when the Moon is in 2nd house. One day you might treat yourself, and the next day you might want to start hoarding your money. You may feel like you are having money troubles even if you are not. Keep track of your finances during this time so that you can know exactly how much money that you actually have. When the Moon is in the third house you will feel more curious. This is a time for learning! Speak to new people, pick up a new book, or even try studying a new subject! Your new-found curiosity will benefit your emotions so long as you are learning (Gemini is the ruling zodiac sign for this house). Restlessness may plague you when the Moon is in the fourth house. Something may feel a little weird in your home, like something just isn’t right. Many people rearrange their furniture or try to pick up a new hobby during this time. The fifth house brings intense emotions to your life. You will want to share your new delightful emotions with friends and family. This is a great time to find a romantic partner or to be with the one that you already have. However, you may also feel indecisive about your hobbies during this time. When the Moon is in the 6th house you will feel a need to be helpful, productive and positive. If your life was previously a bit crazy, then you can use this time to organize your life and possibly sort out your priorities. You will be the happiest when you are doing something when the Moon is in this sign. The Moon in the seventh house in your horoscope brings with it a sense that you need to be closer to your friends, family, and partner. You will not like being alone during this time, and you’ll be happiest when you are surrounded by people you care about. Use this time to make new relationships or strengthen current relationships. As the seventh house passes and the Moon moves into the eighth house, you will still want to be close to the people who you care about, but you will also want to try new and possibly even challenging things. Push your limits during this time. You won’t regret it! Moving into the ninth house, you will start to become bored with everyday life. You will crave adventure! Or, at least something new to do. Make an exciting goal and stick to it. You will be happiest when you are working on, and when you complete this goal. 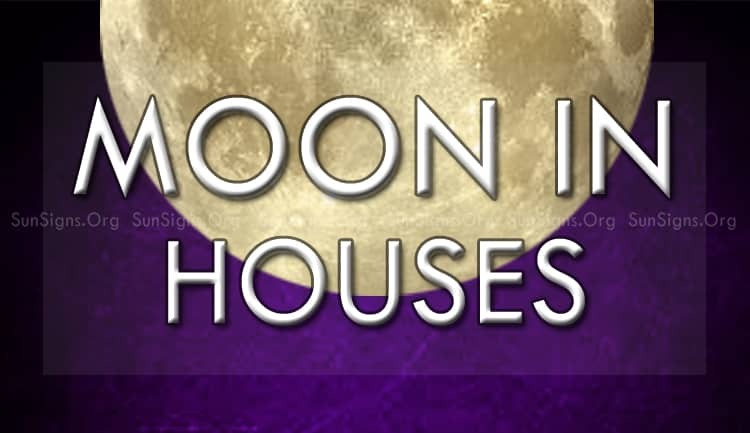 The Moon in 10th house brings along a need to be recognized for all of the great things that you have done when the Moon was in the 12 houses. If you are not congratulated for your successes, you are likely to be upset. Surround yourself with supportive people during this time. The eleventh house is much like the tenth, as you will want support for what you believe in and with the things that you do. If you are not accepted into a group then you are likely to be unhappy. Once again, surround yourself with caring people. Lastly, when the Moon is in the twelfth house you will start to feel more emotionally attached to things like your religion or other invisible things. You may make a large change in your life during this time, or you may simply start to practice your religion during these days.